I needed a break from the heavy layout construction I've been involved with lately, so I decided to have some Foto Fun. Like many prototype modelers, I'm constantly referring to photos to guide my efforts. My photos are on my iPad, which is super handy for bringing into the layout room. But the iPad's way of sorting photos is, to put it mildly, lousy. Everything's all together in one giant folder, so I have to do far too much scrolling/searching and that wastes time. Thankfully, with modern laser printers and some glossy brochure paper, you can print out reference photos to full 8.5x11. You won't want to frame them, but they're certainly sufficient for quick and easy reference. Just tack them up in the appropriate locations . . .
East Haddam pics on the wall behind the (eventual) East Haddam section of the layout. The photos are located approximately where the scene will be depicted. Overview of Essex to East Haddam, with the "Mill Hollow" (Air Line) module in the background. You can just about make out Shailerville Bridge in the far back corner. In my last post, I mentioned that I'd have to change the existing grade from Middletown to Shailerville bridge. But before I could do that, I'd have to move some existing track. Here's what I was confronted with. The track/cork/plywood/riser is where I ended up a few years ago when I first punched through the wall to get to E.Haddam from M'town, and had planned on the bridge scene being much further to the right. Well, as Bill and I discovered, there wasn't enough linear feet to include everything I wanted, so I had to move Shailerville bridge all the way to the left. And forward (to clear the Air Line above). Also, as the track leaves south from Middletown, it goes down a 2% grade to allow it to get underneath Middletown and through the wall to Shailerville bridge. The rest of the southern end of the railroad (E. Haddam-Saybrook) is a few inches lower than the north end (Middletown-Wethersfield), so while the bottom of the grade had been just as the track goes under town, I'd have to continue the downgrade to get to the level of the southern end. First things first though - gotta take care of the track. Of course the track is glued down. Fun Fact: Aileen's Tacky Glue dissolves in water. Well, it doesn't actually dissolve (I wish it did), but it will go back to it's previous state when wet. So I sprayed the track with water, waited, and then veeeerrrryyy carefully pried the track up. Who knew Micro-Engineering spike detail was so blasted delicate??!! The pictures above show how I kept the track separate from the cork and subroadbed. "Why so far apart?" you might ask. Well, I'll tell you - I had to do this extreme separation in order to give me enough room for, um, to allow me to use, eh, a saber saw - upside down and in awkward, tight quarters - to cut away the plywood & cork. I'd recommend you plan better than I did so you never find such extreme measures necessary. Suffice it to say, I don't have a photo of me doing this (though a video would have been priceless). But I relied on my power saw expertise and superior skill & handling to accomplish my goal lucked out. Cork & plywood subroadbed removed; flex track now at rest. I guess I could have left the subroadbed where it was and just moved the track over onto the foam base that will eventually be in this corner. But the transition would have been really tricky - and all this will eventually be hidden, so I didn't want any tricky transitions. What I'll end up doing is gluing the end of the remaining subroadbed directly on top of the foam base and use a shingle to transition down the rest of the grade from there. Roughly speaking, a 2% grade goes down 1/2" every two feet. As I mentioned, I have a 2% grade already, but it's all on straight track. The track from the bottom of that grade to Shailerville bridge is all twisty-turny. So I was hoping to get by with a 1.5 or even 1% grade at most, but I'd have to know how many linear feet I had to work with first. Measuring straight track is straight forward (ahem), but what about measuring the length of curved track? I use one side of a piece of N-scale roadbed, with measurements marked off. It fits right in between the rails of HO scale track (standard gauge) and will bend to whatever curve you need. Using this "tool" I determined that I had 8 linear feet to work with (from bottom of 2% grade to end of Shailerville bridge) and I already knew I needed to drop an additional 1"
Great news! According to the chart above, a 1% grade will drop 1/4" every two feet - so my 8 feet will give me exactly the drop I need! The photo above shows my method for making the grades on my railroad. This is a 2' level. Clamped to the end is a piece of paint stirring stick with a 1/4" mark. The stick is adjusted to that the mark lines up with the bottom of the level. In order to ensure that the track is dropping at a constant 1%, just put this now-modified level on the track. Move your riser up & down and when the bubble is centered, you know your track dropped 1/4" and is at a 1% grade. Then move another 2 feet down the track and repeat the process. BTW, the other "bullseye" level that you see there on the left helps me make sure my track is level side-to-side or, if tilted on a curve, is tilted to the outside of the curve (superelevation). Fun Fact: Cedar shingles drop at a 1% grade (at least this one does). This is what I'll used to transition off of the plywood subroadbed and onto the foam. I hope you do a better job of planning than I did so you don't end up having to cut things out later. But I'm glad that area was never any further along so that I could still get to it (though not easily). And I hope you picked up a couple of tips for calculating and creating grades on your railroad. Shailerville Bridge - as the most dramatic engineering feature on the Valley Line - will be a signature scene on the layout. It's located along the Middlesex Turnpike in the Town of Haddam, right next to the Connecticut River. While it is one of the highest - if not the highest - bridges on the Valley Line, what makes it even more distinctive are the long stone abutments. Looking at the photo, it appears that they've been added to over the years. And my best guess is that they originally supported a covered wooden bridge. 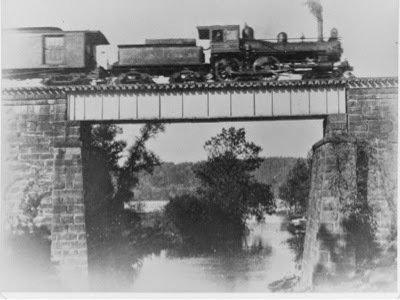 But by my era - in fact, by the late 19th century if the photo is any indication - the bridge itself is a non-descript steel deck girder type. But the cool abutments remain. On my layout, Shailerville bridge is the next scene "north" (left) from East Haddam and the last scene before the track goes through the wall and under (and up to) Middletown. Flipping the map shows how you'll see the scene (remember, Essex to East Haddam, north is to the left). Couple of pretty cool features here, besides the abutments and the bridge itself. Middlesex Turnpike (today's Rt. 154) crosses the same brook (Mill Creek) that empties into the river - but does so at a much lower level (the prototype photo was likely taken from the road bridge). 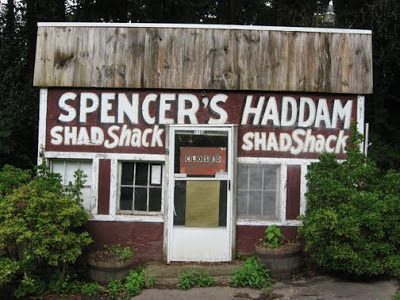 Also - though not shown on the map - is CT's last shad shack. It's been here since 1930, so needs to be on my layout, and will make a neat model. It's a lot to try and get in a small area, and it's especially difficult to try and imagine it in the ether, so Bill suggested we do a mockup. I guess by "we" we mean "Bill"
While Bill made a mess of static-charged styrofoam dust the mockup, I removed some benchwork to make room for the gorge, stream, and the rest of the scene. I had to remove the L-girder flange to make room for the creek bed. There was also a joist and riser there which will need to be shortened before it's replaced. The mockup is roughed in - just need to level things up to see where the grade will need to be. Don't forget to mark where things are before you move them and forget exactly where they were. Even with just a rough mockup, you can really see how this scene is coming together. I'll put in some plywood to support the foam base and make the whole assembly more sturdy. My biggest challenge though will be changing the grade from Middletown to drop the track an additional inch to meet the level of the foam. Fortunately, all that track is on risers, so it should be a simple matter of clamping them, unscrewing them, refiguring the grade, dropping them, and rescrewing them. Sounds complicated, but it's actually pretty easy - especially with my handy-dandy grade-figuring tools. What'll be more complicated is trying to move the existing track - and remove the plywood subroadbed and cork laminate from underneath it - all in a tight corner underneath the Air Line.